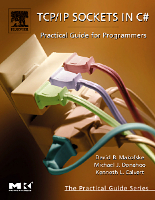 Welcome to the website for Makofske, Donahoo, Calvert: TCP/IP Sockets in C#: Practical Guide for Programmers. 1 - Requires ItemQuote.cs, ItemQuoteTextConst.cs, Framer.cs, ItemQuoteDecoder.cs and ItemQuoteDecoderText.cs from Chapter 3. 2 - Requires ItemQuote.cs, ItemQuoteTextConst.cs, Framer.cs, ItemQuoteEncoder.cs and ItemQuoteEncoderText.cs from Chapter 3. 3 - Requires TcpClientShutdown.cs from Chapter 4. 1. Go to the Microsoft Developer Network Site (http://msdn.microsoft.com/netframework) and download and install the .NET Framework SDK. You can also open a regular windows command prompt and run sdkvars.bat (v2.0 and lower) or SetEnv.Cmd (v3.0 and higher) to set your environment variables. If you are using SetEnv.Cmd you may need to use the /V:ON option when launching your command prompt. Microsoft (R) Visual C# .NET Compiler version 7.10.3052.4 for Microsoft (R) .NET Framework version 1.1.4322 Copyright (C) Microsoft Corporation 2001-2002. All rights reserved. To run a program type the name of the program with a .exe extension or no extension along with any command-line arguments.To run a program type the name of the program with a .exe extension or no extension along with any command-line arguments. Note: Some of the programs in Chapters 4 and 5 utilize source files from earlier chapters, as described in the download section. The batch files for Chapters 4 and 5 will automatically look for these files in the appropriate chapter directory. You will need to download the entire archive or all required chapter zip files for these programs to compile correctly. IPAddressExample2.cs, TcpEchoClientSocket2.cs, UdpEchoClientTimeoutSocket2.cs,TcpEchoPeekClient2.cs, TcpNBEchoClient2.cs, TcpPollEchoClient2.cs,and TcpEchoClientAsyncSocket2.cs. The purpose of this book is to provide general information about network programming as of the book's publication date. The authors have included sample code that is intended for the sole purpose of illustrating the use of the sockets API. Neither the authors nor the publisher are aware of any third party patents or proprietary rights that may cover any sample of any kind. The authors and the Publisher DISCLAIM ALL EXPRESS AND IMPLIED WARRANTIES, including warranties of merchantability and fitness for any particular purpose. Your use or reliance upon any sample code or other information in this book will be at your own risk. No one should use any sample code (or illustrations) from this book in any software application without first obtaining competent legal advice.